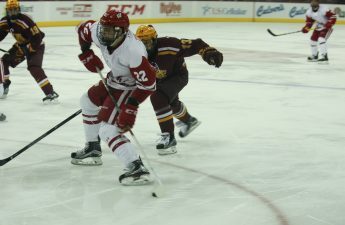 After defeating Michigan the night before, the Badgers hit the ice again Saturday night in search of a weekend sweep over the Wolverines. Wisconsin didn’t waste any time getting on the board, eight seconds to be exact, when sophomore Trent Frederic caught the Wolverine defense on their heels to give the Badgers an early 1-0 lead. Michigan didn’t waste much time of their own, responding just 35 seconds later and tying the game at 1-1 before a minute of hockey was played. Just less than four minutes later the Wolverines struck again to take a one-score lead early into the first. This game was cracking up to be a high-scoring affair as the opening minutes ensued. After senior Corbin McGuire committed a hooking penalty, the momentum looked to turn in Michigan’s favor with an upcoming power-play opportunity. That momentum would be turned upside down when Trent Frederic forced a turnover leading to his own breakaway goal to tie the game once more at 2-2. “He reads it well, he’s a brilliant hockey player as far as recognizing opportunities,” head coach Tony Granato said. 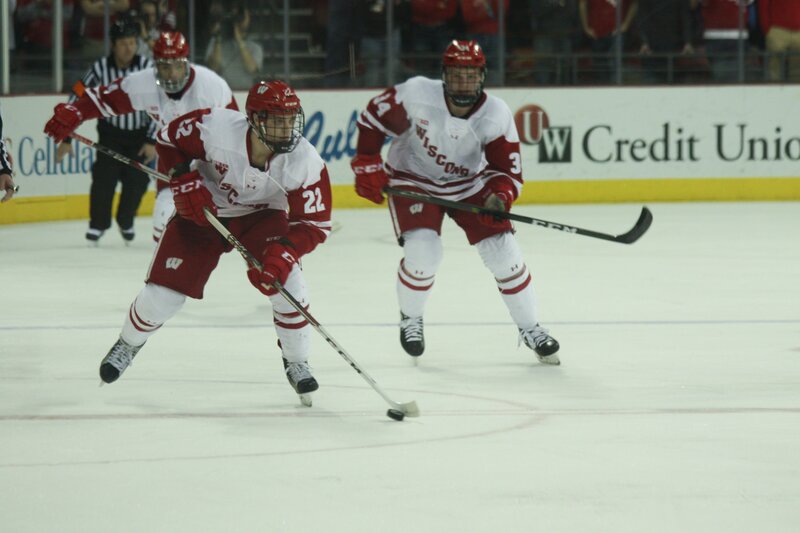 The Badgers entered the first intermission tied with the Wolverines and would leave the second period in a tie as well after both teams netted a score in the second. Michigan was not backing down this time as they responded to a third-period goal from defenseman Jake Linhart, forcing the fourth tie of the game. 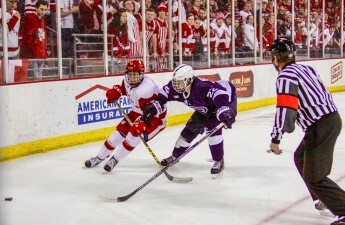 Another Wisconsin defenseman would find the back of the net when sophomore Peter Tischke scored midway through the third, giving the Badgers a 5-4 lead and eventually the win. “Obviously, they’re a good team, they’re hard, they never give up, and after they came back after that fourth goal and we got the fifth one we just realized that we had to bear down and finish the game,” Tischke said following Saturday’s win. The Badgers did bear down as the third came to a close, forcing the Wolverines to pull their goaltender with minutes remaining. Adam Cavallini silenced any late game heroics with an empty-net score, ending the game in a 6-4 victory for the Badgers. Cameron Hughes finished the night with an assist hat trick, two of those assists going to Cavallini who, along with Frederic, had two goals on the night. Frederic finished the weekend with an impressive four goals over the two-game series as he continues to light it up for the Badgers. “The puck was coming to me and guys were making nice plays and I just happened to be there so it was a good weekend and it’s good to get two wins,” Frederic said. A sweep for the Badgers this weekend means a chance to jump into first place in the Big Ten next weekend as they head to Minnesota to take on the No. 5 Gophers. Next weekend’s matchup could very well be the biggest series of the year for the Badgers, and after sweeping the Wolverines at home, Wisconsin looks poised to make a run for the number one spot in the Big Ten.